I am midway through the Planet Earth DVD that I got for my birthday and I could not wait to finish it to blog about it. 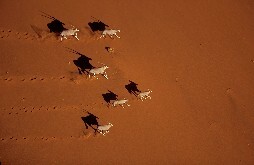 The first typical shot is that of the herd, shot from shoulder height or below. You see a bunch of animals move by in and out of the frame, the scene is covered in dust, it focuses in and out between an animal nearby and an animal far away. Then you see a pack of lions stalking the herd. It is not clear at this point whether you and the lions are looking at the same herd. For all you know those lions may have been filmed a month earlier. Then you cut to a scene where you see a mother wildebeest (or gazelle, or kudu, or zebra or antelope) with its calf. The narration that follows is, I kid you not, identical in every documentary every filmed. It goes like this: "The lions are looking for the injured, weak or newborn that will make easy prey." It must be a standard line you have to include before you are allowed to film in the Serengeti. I have not yet seen the filmmaker with the cojones to say "We are going to follow this pride of lions until they hunt a badass alpha-male bull in its prime and bring that beast down and we are not going to give up until we film it." But I digress again. Then the lions start running, after they hear the African drum background music, going tum-tum-tum-tum, which is also a standard, and the chase begins. At this point, there is confusion, the lions get lost in the grass, the jeep filming the lions can't keep up, the frames are moving up and down, the tum-tums get faster and faster, and somewhere in the distance you see the lion catch the wildebeest, and pow, cut to the next scene where a bunch of lions are eating something. The catch seemed real, the feast, could have been at a zoo. The point is, with poetic license to humor, that, during the entire process you lost the big picture of what's going on with the herd, the other lions etc. I don't want to belittle the effort, many young kids, including myself, saw these in bewilderment. It was inspiring. We loved watching it. Planet Earth takes this experience to a new level. The heli-gimble is a camera, mounted on a helicopter that can zoom in from 1km away. More remarkably, it compensates for the motion of the helicopter so the shots are rock solid from far away and close up. That makes all the difference. You now can follow the hunter and the hunted from beginning to end, starting from a high up view, zooming down as the chase nears its end. Since this is all done from 1km away, the animals are completely undisturbed by the camera. You also see the massive herds move and change the terrain as they do so, rising massive clouds of dust. You appreciate how big they are. The series is narrated by the master storyteller of storytellers, Sir David Attenborough. In his own eloquent words: "For th first time, wildlife can be put in context of the epic landscape in which it lives." That sums it up. Our children will grow up with that understanding. Thank you BBC for making this inspirational series. This is a must own DVD, one where you don't look at the price tag. Thank you Ayse and Pete for giving it to me, it's one of the best gifts I've received in years. make sure you get the British version... The American version is narrated by Sigourney Weaver. It's not bad, but she doesn't have much enthusiasm in her voice. It is the best documentary I have ever seen (and I love documentaries). But this one is for High Definition. PS3 and a Runco projector makes the perfect couple for watching Planet Earth series. If you dont have a Blu-ray player or HD DVD player ask one of your friends to watch this series in HD.Even 720p version is outstanding. Yes, this DVD makes me want to get an HD-DVD player. I've been holding out. Wow, sounds like a great gift. Is it ok for young kids? A direct link from AlwaysOn rather than a syndicated link - this is a novel experience. First of all thanks for using the word "cojones" in the above blog because I have often incorrectly used the word "kahuna's" when I always meant "cojones". The best thing about this DVD is that its great to share great video with kids that is more than just a daily diet of short clips on their favorite video portal. Rather than chirp on about the quality of modern education, there is no better role for a parent than to foster quality as an alternative to time passing entertainment. For me it is not as much as about inspiration as appreciation - for inspiration by itself is like water, after a certain amount of time it evaporates rather than sustains. Appreciation requires active taste and sustenance. We all eventually become directly proportionate to the quality of the company we keep and thus a high quality relationship with the media involves not only great feeds for the mind, but the resulting discussions with ones kids which proves that quality of media is breeding quality of life. Proof in this context is all about relationship rather than evidential requirement. I was contemplating over this weekend the difference between enjoyment and pleasure and why is that I consider pleasure to be the inferior of these species. If we allow the animals to hunt for food, we humans can free ourselves to hunt for meaning and thus develop a multilevel consciousness. Such consciousness hopefully determines that both joy and pleasure are human values. Once we know it is about values then we can ascertain a resulting difference between using media for reactive pleasure and applying media for proactive joy. So this posting has helped me determine that joy and pleasure have equal value in life, the determination comes from values not the expressed opinion or an emotionally intelligent feeling. What I am therefore reading in the posting above is the expression of proactive joy and so I appreciate following words here rather than simply herds simply to hunt down a human quality I am looking for called intelligence. Thankfully what this DVD ultimately proves to me is that if we are to be enriched by quality of life then when we can do ourselves an individual favor, which is to note the relative paradise that is our accommodation of Planet Earth in relationship to what we prescribe human qualities and values to. I recommend all David Attenborough videos and some of the books on your left for a similar kind of joy and appreciation. Baris, this is where this fundamental distinction between inspiration and appreciation is most acute for me. Appreciation and not inspiration in my mind is the venture capitalists primary forte. In a venture capital sense, to appreciate is to recognize and increase value. Depreciation is the reverse of this value for it is determining the recovery of on-going utilization of value, which is the clawback of an asset being actively actively utilized. So, first of all remember that I am simply thinking out aloud here so my thoughts about appreciation below are simply an ingredient for my own personal awareness, rather than a deliverable, definable or a demanded value. Now, what I want to do is here is place David Attenborough into this apprecation lens and in so doing explore or suggest why I thnk inspiration by itself is insufficient as a human asset value. By apprecating David Attenborough's talents what I would like my takeaway to be here is to determine how it is I would find a "David Attenborough" type in the wider population, for if I can appreciate One type of "David Attenborough" then IMHO I can scale this as my own skill to appreciate talent. This means that through inspiration I may merely consume or purchase more of David Attenborough's products, but to increase my intelligence of being or becoming more talent aware, my powers of collective observation become that much more acute and intelligent when I become more astute as to what it is I am looking for or studying. The great irony here is, that just as David Attenborough is a great observer of anthropological and animal behaviour, so what can we learn by observing the observer? To improve such personal observation I would add another British observer for talent appreciation, and his name is James Burke. These two professional kindred spirits have developed a way of observing that adds great value to individual insight capability. That means my exploration does not stop at the DVD. It is not enough for me to be a consumer of media, and it would be utterly valueless for me to be simply inspired by media content, for what I am exploring here is what it means to be inspired by being, not simply what the media shows us at an obvious level. Another way of looking at this is that the word "did" is only one letter removed from the word "die". In other words I cannot simply allow inspiration to fade and die, and this can be achieved by formulating a more comprehensive view of what appreciation is or can be. I therefore am suggesting that a movement from inspiration to appreciation is by itself a significant act. The real joy here is knowing that with each ounce of observed experience, with each thoughtful word, with each explorative step, enjoyment is more and more attached to the creation of additional value. David Attenborough and James Burke both observe from a lens of appreciation and such quality has more energy and light to it than the emitted gas or spark of inspiration (Indeed we can add the enthusiasm of Steve Irwin to this observer list). The BBC have no monopoly on such human beings, the BBC have simply found and funded two people who exhibit this particular kind of trait and talent. So in a world where value becomes a pleasure when we learn or adapt our existence, I am contemplating today the transformative power of appreciation which may lead us to uncommon insight. So what special talents of observation do you think David Attenborough has that makes him such a great environmental observer? The best way for me to put nature into context is relate to nature as a collective intelligence. I reckon David Attenborough taught me more than all my science teachers put together. However, I would have ended up only with an excellent knowledge of foreign fauna were it not for Bill Oddie and his trusty coverage of British avians. Planet Earth, Blue Planet and all those others are an invaluable contribution to education and gift ideas! How did the horrific nature of fighting in the Great War serve to create bonds of camaraderie between soldiers (and even between enemies), while at the same time creating a sense of alienation from civilians?